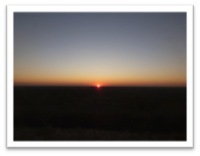 Our journey to the Etosha National Park of Namibia last weekend started at 3AM. We drove out of Wadadee Katutura onto the straightest highways I’ve ever been on. (fun fact: in Namibia foreigners have the highest number of accidents due to how straight the highways are) By around 6:30AM we stopped to indulge in the beautiful scenery put on by the rising of the sun. 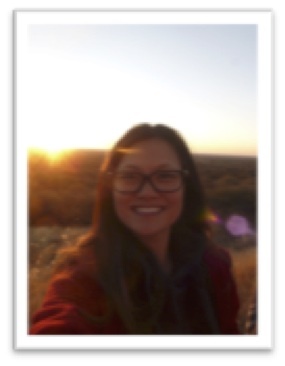 While waiting for the sun to rise, we were able to experience the bone chilling coldness of an African winter. Though there were no clouds or snow, it was FREEZING (in the desert there is nowhere for the heat to be absorbed)! I was wearing my shorts, sweatpants, sweaters and a scarf. After the sun fully rose above the horizon, we continued on with our journey. 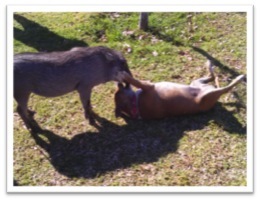 By 9:30AM we stopped for breakfast where we met Pumba the warthog and his best friend bulldog. Pumba is completely wild but was adopted onto the camping ground (large), whereas his friend bulldog (we never figured out his name) is actually owned by the people working at the campsite. It was adorable to see the two animals toss and play around like childhood bros.
By around 12PM we arrived at the gate of Etosha, excitements in the van started to grow as we were beginning (for some of us) our first-ever game drive. The first animals we encountered were zebras, followed by springboks and giraffes. As the sunset we headed back to the campsite before it closed at 4:30PM. 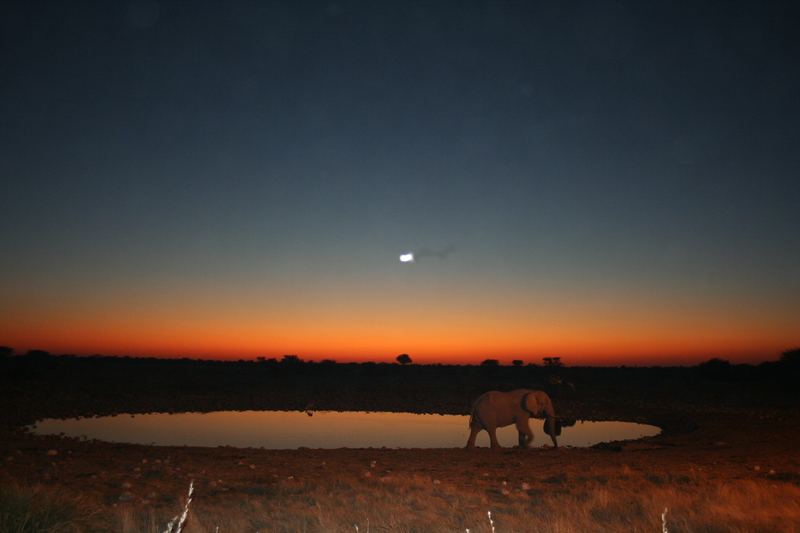 At night we were able to visit the water hole and witnessed a lioness hunting a spring bock. After we ate delicious dinner we went to bed. It was the roughest night of my camping experiences. I woke up to lions roaring so loud that I thought they were right beside me. And then the desert decided to unleash its coldness on me. I had on two sweaters, sweat pants and earmuffs under the sleeping bag, but it was so cold I decided to put on my rain jackets and rain pants. Finally morning came and after breakfast was served we set out on our second day of adventure. And the first thing we saw was a LION! It was so beautifully laying down and enjoying the morning glow. As the sun rose we continued our safari ride where we saw wildebeests, an African wild cat, various African birds and Oryx. By afternoon we arrived at the pan. The pan was completely dry as it was the dry season. It was dried out millions of years ago leaving a layer of salt and minerals. During the wet season the pan will get covered with a thin layer of water. After several photo shoot session at the pan, we started out journey back to the campsite. 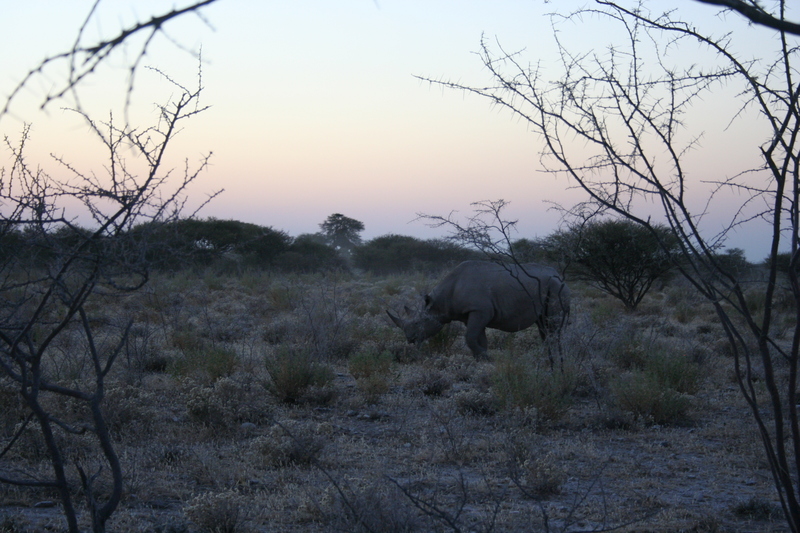 And luckily we were able to see not one but three black rhino; and two were a mother and a baby rhino. To top off the day, dinner was delicious! We had pasta with squash stuffed with cream corn. It was one of the best camp dinners I’ve ever had! Mekale and I wanted to see lions at the water hole so we decided to camp out and sleep by the water hole. The sun during the day was so strong that the rock chairs were still warm even an hour after the sunset. However; as the night went on Mekale and I decided that it was too cold so we headed back to our tent. The coming morning was sad as we had to head back to Windhoek; but we had two very good surprises. As we were leaving the Etosha Park there were two Himba ladies with their children selling jewelries for their community. We wanted to take pictures with them and of them; so in return we were asked to give support to the community. The Himba people are one of the many indigenous tribes of Namibia. They are considered the last nomadic people of Namibia and have retained their culture very well despite the influence of colonization. One of the very distinct feature of the Himba people is that they rub otjize (a red mixture of animal fat, fragrants and ochre pigments) to prevent sun burn, bug bites and to display beauty. I was very interested in experiencing this mysterious rubbing of the otjize so I asked the lady to rub the otjize into a thin strand of my hair. The lovely lady happily agreed and instead of rubbing the otjize into just a thin strand of my hair, she ended up rubbing it into my whole head and MY FACE! It was a humorous and priceless moment. Our second surprised was at the crocodile farm. We were walked through by a tour guide to learn about the farm and the crocodiles that were there. The crocodile farm really shined light on human exploit animals for not just food but handbags, wallets and things that are not essential to living. 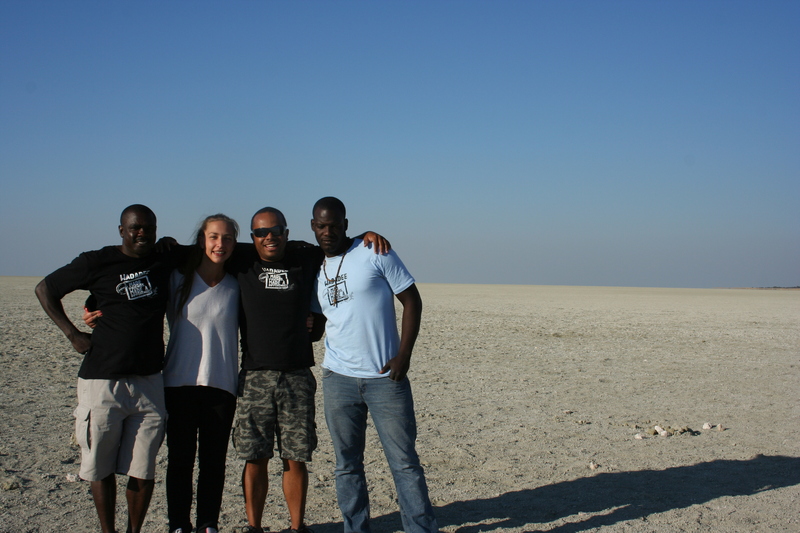 For me, I guess the Etosha trip was not just a trip where I got to enjoy seeing exotic animals. It was a trip that showed me how beautiful the world we lived in is. It was unreal to think that black rhinos are on the brink of extinction because of their tusks; and elephants are hunted everywhere for not only their tusks but locked up in circuits for our entertainment. I wish that everyone could have the opportunity to witness such beauty and realize the impacts of our actions on these animals. I guess I can sign off with this statement: humans are the only animals that can express compassion through words and action, then why is it that we are responsible for so many animals’ extinction? What does that say about our priorities? Is it tusks? Is it another crocodile belt? Is it delicious exotic meat? Or does it all boil down to money? It is hard for me to understand killing of these beautiful animals to the brink of extinction when we humans are the only animal capable of compassion. 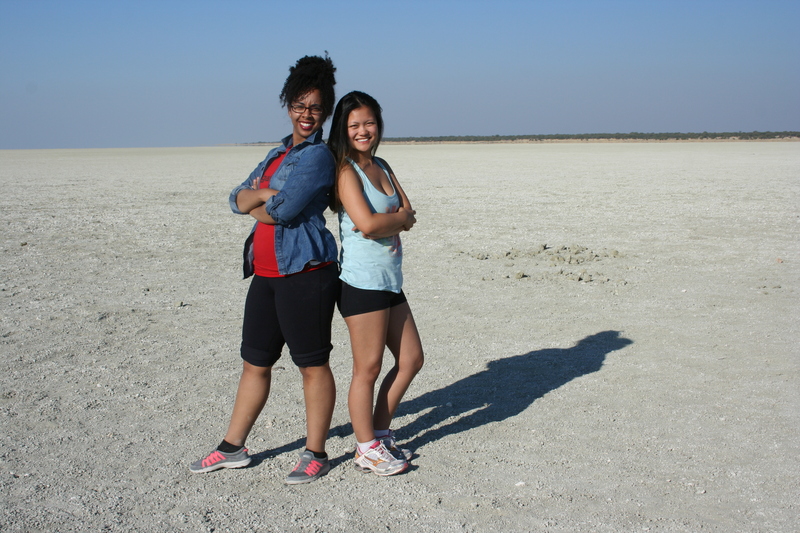 This entry was posted in Namibia, Summer Term 2014. Bookmark the permalink.